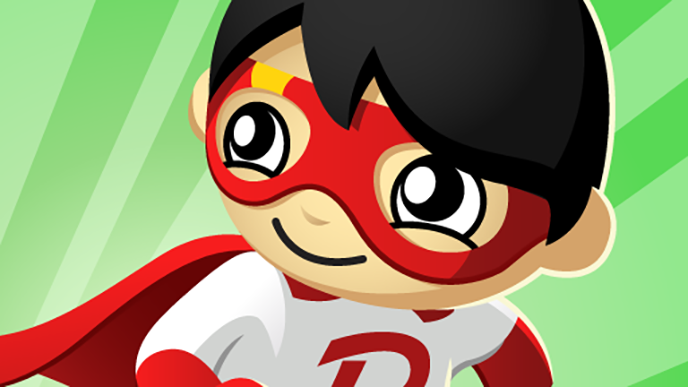 This mobile endless runner stars Ryan from the popular YouTube channel Ryan ToysReview. Tag with Ryan is a free mobile game on iOS and Android devices that stars Ryan, the little boy from Ryan ToysReview, a popular YouTube channel with 18 million subscribers as of this writing. In Tag with Ryan, players become Ryan, who is playing tag with Combo Panda. Players will need to help Ryan run away from Combo Panda by swiping left and right to move Ryan between three running lanes, and swiping up and down to make Ryan jump over or slide under obstacles in the path, respectively. If you or your kiddos have played games like Temple Run or Subway Surfers, the gameplay in Tag with Ryan is very similar. While running, players also need to watch out for Gus the VTuber, who runs along the path in front of Ryan. If players can catch up to Gus, they can tap the screen to “tag” him and unlock a new costume for Ryan to wear, like a superhero or pilot costume. Each costume gives players certain bonuses as they play. Players can also collect boosters as they run, such as magnets that attract nearby Sun symbols scattered along the path (when a magnet isn’t active, players can collect Sun symbols by simply running into them). These Suns can be used to upgrade Ryan’s costumes, improving the bonuses they provide. Finally, players can complete daily missions to receive free in-game rewards. While Tag with Ryan is free to download and play, it does contain optional in-app purchases, allowing players to purchase items like toy vehicles that will help Ryan in future games. Tag with Ryan is available to download for free on iOS and Android devices. The game is rated E for Everyone. Check out our SuperParent First Look video below to see Tag with Ryan in action.